Oral health has been recognized as an essential component of general health. Although there has been substantial improvement in children's oral health over the recent decades, the overall health status of children does not paint a rosy picture. Based on the data available from the WHO oral health database, it was estimated that 200,335,280 teeth were decayed, filled, or missing among the indicator age group of 12 years. In India, the National Health Survey (2004) estimates the prevalence of dental caries as 51.9%, 53.8%, and 63.1% in 5, 12, and 15 years, respectively. Oral health plays a pivotal role in the overall health status and consequentially in determining the quality of life of children and adults. The child's ability to develop several social and physical functions is enhanced by good oral health. On the contrary, poor oral health leads to pain, discomfort, reduced self-esteem, embarrassment, and impairments of daily life activities. Poor oral health and untreated dental conditions can have a significant impact on the quality of life of children, which may lead to an overall deterioration of health. Various chronic diseases are known to affect children interfere with the child's ability to succeed in school. Literature shows that increase in missed school time caused by chronic health illnesses can lead to decline in school performance. Gift has shown that approximately 51 million school hours per year have been lost because of oral health-related illness in the US population. School absenteeism data are one of the effective and efficient sources for monitoring disease activity and are potentially an alternative way for community-based disease surveillance. Poor oral health status was associated with increased parental reports of low child school grades. Furthermore, low school performance was associated with school absence because of dental pain or infection and not with the absences for routine dental care. Children with both poor oral and general health were 2.3 times more likely to perform poorly in school than those with good health. Self-esteem is defined as the one's overall evaluation of oneself, i.e., the extent to which one values and accolades the self. A person who is overly critical of himself or herself may have a more negative self-evaluation and thus lower self-esteem. Although people with high self-esteem (HSE) have more favorable self-views than their low self-esteem (LSE) counterparts, LSEs do not necessarily view themselves negatively. LSEs have either ambivalent attitude toward the self or evaluate themselves less positively than do HSEs. “Oral diseases and their treatments may undermine self image and self-esteem, discourage normal social interaction and may also interfere with vital functions such as breathing, food selection, eating, swallowing, and speaking and with activities of daily living such as work, school, and family interactions” stated by US Surgeon General David Satcher (2000). Schools are considered to provide the most favorable environment to impart oral health education to children. Schools remain an important setting, offering an efficient and effective way to reach many children and through them, families, and community members. There are enough reasons to believe that oral health influences the children's academic performance, absenteeism, and self-esteem. Literature review showed that no studies have been conducted in India, assessing these variables. Hence, a study was planned to assess the impact of self-esteem and academic performances of school-going children on their oral health status. The study has also attempted to check the feasibility of using readily available school performance records and absenteeism data as proxy measures of oral health status. This cross-sectional study was strategized in association with various private schools in Tiruchengode, Western Tamil Nadu, in South India, to determine the impact of self-esteem and academic performance of school-going children on their oral health status. The study design and protocol were analyzed and approved by the Institutional Review Board of KSRIDSR, Tiruchengode, Tamil Nadu. The purpose of the study was explained to the school authorities and their approval was obtained. A written informed consent in the native language (Tamil) from the parents and assent from the participants was obtained before the study. The study was carried out during the period August 2014 to December 2014. No parent article was available before the start of the present study, and hence, a pilot trial was conducted. The sample size was estimated to be 1400. In the present study, convenience sampling was done based on permission and consent from school and parents. The study sample included 2014 school-going children (907 girls and 1107 boys) aged 12–15 years. Schools, with English as medium of instruction, were randomly chosen in and around Tiruchengode, Tamil Nadu. Care was taken to include schoolchildren in the same socioeconomic status. Children with systemic problems, those who were medically compromised, or those who were not willing to participate in the study were excluded. A questionnaire was prepared for the study with the following components: (i) demographic data, (ii) personal oral hygiene history, (iii) Rosenberg self-esteem scale (R-SES), (iv) data regarding school absenteeism and percentage of marks in first language and mathematics, and (v) a question to the parent regarding homework completion based on a 3-item scale about how often the child completed his/her homework. Children filled out the questionnaire in their classrooms during the regular class session. The questionnaire was designed to be completed in 20–30 min. The primary investigator (PI) and the class teacher monitored the event. The children were explicitly told that there were no correct or incorrect answers. Any difficulties faced by the child in understanding the questions were clarified by the PI. If the child did not understand certain words, a synonym or analogy was provided by the PI. Children were asked to answer all the questions, and care was taken that the children answered the questions without discussing with friends. Demographic data included name, age, gender, grade, class section, and the name of the school. A unique identification number was given to each child and it was recorded in the questionnaire. Oral hygiene history included frequency of brushing teeth daily, materials used to clean the teeth, and the frequency of dental visits. The Rosenberg scale was used to assess the self-esteem of the children who participated in the study. This scale included ten statements: five positively phrased and five negatively phrased statements to assess the participants' overall impression of themselves. The response categories for each statement ranged from strongly agree to strongly disagree. For the positive statements, scoring was done as follows: strongly agree = 3, agree = 2, disagree = 1, and strongly disagree = 0, and for negative statements, the scores were reversed. The possible range of total score was 0–30. The children were grouped into two based on the median score. A higher score on this scale reflected a greater self-esteem and lower score indicated a possible low esteem. School absenteeism data of each child were collected from the attendance records in their respective schools. School absenteeism was measured as the percentage of school days missed in the last academic year and it was recorded as follows: (i) <5%, (ii) 6%–15%, and (iii) >15%. Academic performance data included marks obtained in first language and mathematics assessments. These data were collected from previous academic year records. They were categorized as follows: (i) >80, (ii) 60–80, and (iii) <60. School absenteeism, first language, and mathematics records were not obtained from one school as they did not have the soft copies of the previous year's data. Hence, the sample size for these variables was reduced to 1751 children (799 girls and 852 boys). Data regarding homework completion were obtained from the parents based on a 3-item scale question about how often the child completed his/her homework: (i) always, (ii) usually, and (iii) sometimes. Children were examined in a room with natural light having adequate illumination. Mouth mirror and explorer were used to assess Decayed, Missed, and Filled Teeth (DMFT) index and Oral Hygiene Index-Simplified (OHI-S) (American Dental Association Type III examination). The data obtained were statistically analyzed using SPSS software (version 17, Chicago, IL, USA). In self-esteem, the median score was taken as the cutoff value. Children who scored higher than the median value were considered as having HSE and vice versa. OHI-S score ranges from good, fair, to poor. For statistical analysis, index dichotomization was done, i.e., fair and poor were clubbed together. To find the association between the independent and dependent variables, Pearson's Chi-square test was used and odds ratio (OR) was calculated with 95% confidence interval (CI). Mann–Whitney test was used to compare the mean between two groups and Kruskal–Wallis test was used to compare the mean of three groups. P ≤ 0.05 was considered statistically significant. The total sample size was 2014. Out of 2014 children, 45% (n = 907) were girls and 55% (n = 1107) were boys. School absenteeism, first language, and mathematics records were not obtained from one private school as they did not have the soft copies of the previous year's data. Hence, the sample size for these variables decreased to 1651 (799 girls and 852 boys). The median score for self-esteem was 19. Children who scored higher than 19 were considered as having HSE. 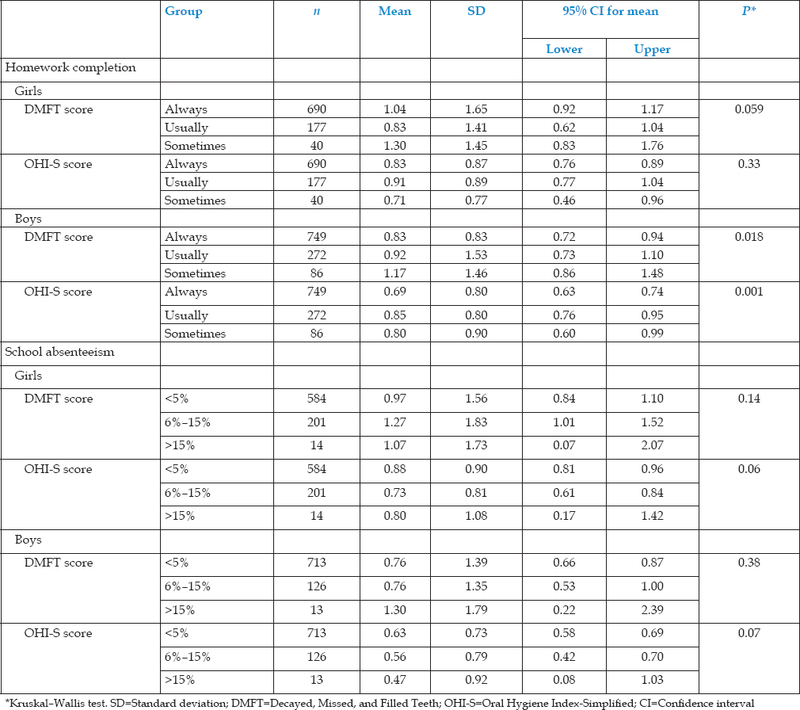 [Table 1] shows that there was no significant association between self-esteem and DMFT/OHI-S score. 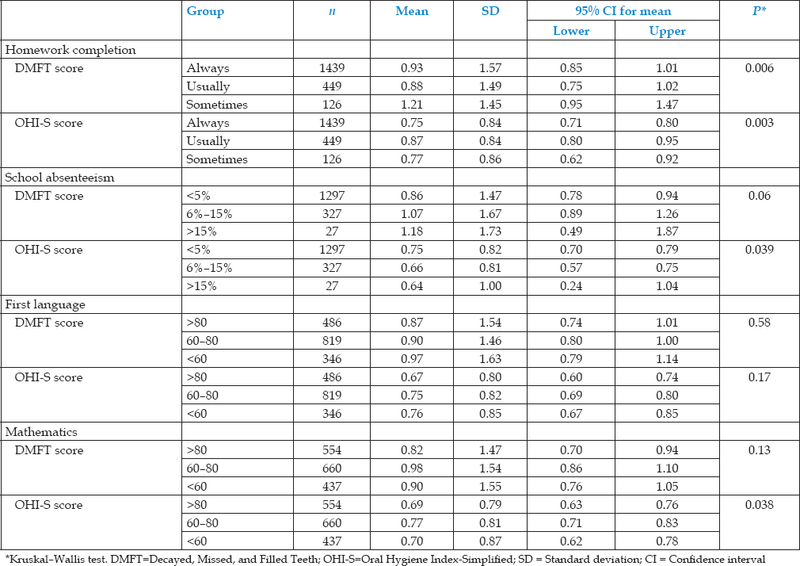 When comparing the mean DMFT and OHI-S scores between HSE group (>19) and LSE group (>19), the difference was not statistically significant [Table 2]. When gender-wise association between the independent variable (self-esteem) and dependent variables (DMFT and OHI-S scores) was made, there was no statistically significant association between these variables. [Table 3] shows the association between school academic performance, homework completion, school absenteeism, and DMFT score. There was a significant association between homework completion and DMFT score (P = 0.002) and school absenteeism and DMFT score (P = 0.007). There was a significant association between school absenteeism and OHI-S score (P = 0.001). 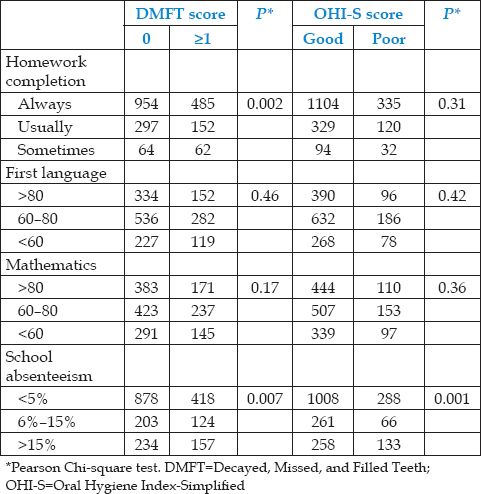 [Table 4] shows the comparison of mean DMFT and OHI-S scores between the groups in homework completion, school absenteeism, first language, and mathematics scores. There was a significant difference in the mean of DMFT between the groups in homework completion (P = 0.006). When comparing the mean of OHI-S score between the groups, there was a significant difference seen in homework completion (P = 0.003), school absenteeism (P = 0.039), and mathematics (P = 0.038) variables. Gender-wise association was analyzed between school absenteeism, homework completion, and oral health [Table 5]. In girls, there was a significant association between homework completion and DMFT score (P = 0.031). In boys, there was a significant association between homework completion (P = 0.011), school absenteeism (P = 0.001), and DMFT score. In girls, there was no significant association between OHI-S score and any of the variables. In boys, there was a significant association between school absenteeism (P = 0.001) and OHI-S score. When gender-wise comparison of mean DMFT and OHI-S scores was made between the groups in school absenteeism and homework completion, boys showed a significant difference in mean of DMFT (P = 0.018) and OHI-S (P = 0.001) scores in homework completion variable [Table 6]. Oral health is a critical but an ignored component of overall health and well-being, especially among children. Oral health problems such as dental caries and gingivitis are global health problems in both developed and developing countries. The last three decades have seen massive improvements in children's oral health in most industrialized countries, whereas the improvements in developing nations were below par. The above facts heightened the search for indicators that identify those who were at greater risk of having the disease. It is necessary to identify community risk indicators that are directed at specific targeted population. Since children are often the most important victims of dental diseases, it is important to identify the risk indicators of oral diseases at school level. Hence, this cross-sectional study was planned to assess the extent to which children's oral health is related to some of the variables such as school performance, school absenteeism, and self-esteem. Socioeconomic status is an important risk factor of oral health. All the children in the study were from private schools, and considering their annual school fee structure, their socioeconomic status should be in the same level. This is in accordance with the study done by Piovesan et al. who demonstrated that type of school could be used as an alternative measure of socioeconomic status in epidemiological dental caries surveys when it is not possible to collect data individually. Self-esteem is related to a person's social world and has been defined as an individual's personal judgment of their own worth. Where the appraisal is negative, the level of recorded self-esteem is likely to be low. The individual with LSE feels relatively helpless and inadequate, whereas the individual with HSE feels more confident to overcome adversity and achieve success. The R-SES was typically cited as one of the original and most popular measures of self-esteem. This scale has been shown to have high internal consistency, high test–retest reliability, as well as convergent and discriminant validity. However, the drawback of using this scale was that, like all self-report measures of self-esteem, it was contaminated to some extent by social desirability of having HSE. Macgregor and Balding showed that toothbrushing frequency was positively associated with adolescents' self-esteem. Another study by Källestål et al. demonstrated that the association between self-esteem and oral health behavior/toothbrushing frequency disappeared during adolescent age. In the present study, there was no significant association between self-esteem and DMFT/OHI-S score in the total population. When determining the association between self-esteem and DMFT/OHI-S score, stratified by gender, there was no significant association between these variables. This nonsignificant association between self-esteem and other dependent variables might be due to various reasons. Baumeister et al. showed that associations between self-esteem and external variables most often were absent or very weak. Self-esteem tends to fluctuate during development. During early childhood, self-esteem tends to be quite high, perhaps due to the children's egocentric style of thinking. As childhood continues, self-esteem gradually decreases and continues to diminish through adolescence, which reflects the biopsychosocial changes in the adolescent life. In this study, homework completion, school absenteeism, first language, and mathematics were taken into consideration. First language and mathematics were only included to assess the academic performance based on the National Survey of Children's Health Questionnaire. School absenteeism showed a significant association with DMFT and OHI-S scores, whereas homework completion showed association with DMFT score alone. Children who were irregular in their homework completion had a higher mean DMFT score when compared to the others, and the difference was statistically significant. When comparing the mean of OHI-S score between the groups, there was a significant difference seen in homework completion, school absenteeism, and mathematics variables. In girls, there was a significant association between homework completion and DMFT. In boys, there was a significant association between homework completion, school absenteeism, and DMFT score. There was no significant association between OHI-S score and above variables in girls, whereas boys showed a significant association between OHI-S score and school absenteeism. Furthermore, the mean DMFT and OHI-S scores were significantly higher in boys who did not perform their homework regularly. Crowley et al. showed that a high level of dental restorative treatment need was significantly associated with poor school league table results in English, mathematics, and science. According to Muirhead and Marcenes, there was a significant association between school DMFT score and explanatory variables such as English, mathematics, and linguistic awareness of reading readiness test. Blumenshine et al. showed that children with both poor oral health and general health were significantly related to school performance. Garg et al. assessed the impact of poor oral health status on school performance in primary school children. They concluded that the relation between school performance and mean decayed and filled teeth was statistically significant. Piovesan et al. showed that children with low oral health-related quality of life had high school days missed and poor school performance. A report by the US General Accounting Offices (2000) stated that children with poor oral health were 12 times more likely to have restricted activity days than those children without oral disease. In general, consistent results were obtained only with two variables: school absenteeism and homework completion. When analyzing the school absenteeism, it is important to control the confounding factors such as general health. There was a lack of specific data that would indicate the days missed from school were because of oral health problems. Further probing is needed to assess whether their absence in school was due to oral health-related issues. School performance data were based on standardized tests conducted in schools and need not necessarily measure the actual intelligence of these children. It is important to create specific tests in the Indian scenario to assess the academic performances of children. Schools have traditionally been the target of oral health education initiatives and provide an easy way to access a large volume of children. Studies regarding the association between oral health and school performances are needed as they provide the blueprint for planning future school dental health programs. It is an established fact that oral health status has an impact on the academic performance of school children. There is a lack of consensus on how school absenteeism and academic performance contribute to oral health. In this study, school absenteeism and homework completion have been considered as independent variables. The oral health of the child has been included as a dependent variable, and its association with the independent variables has been assessed. No cause and effect relationships can be inferred from this cross-sectional data. Children from private schools were only included in the study which could affect the generalizability of the results. School records such as absenteeism data and homework completion can be used as proxy measures of the oral health status in children. Bratthall D. Estimation of global DMFT for 12-year-olds in 2004. Int Dent J 2005;55:370-2. Bali RK, Mathur VB, Talwar PP, Channa HB. National oral health survey and fluoride mapping. An Epidemiological Study of Oral Health Problems and Estimation of Fluoride Levels in Drinking Water. New Delhi: Dental Council of India; 2004. p. 67-78. Petersen PE. The World Oral Health Report 2003. Continuous Improvement of Oral Health in the 21st Century – The Approach of the World Health Organization Global Oral Health Programme. Geneva, Switzerland: World Health Organization; 2003. Available from: http://www.who.int/oral_health/media/en/orh_report03_en.pdf. [Last accessed on 2014 Dec 15]. Fowler MG, Johnson MP, Atkinson SS. School achievement and absence in children with chronic health conditions. J Pediatr 1985;106:683-7. Gift HC. Oral health outcomes research: Challenges and opportunities. In: Slade GD, editor. Measuring Oral Health and Quality of Life. Chapel Hill, NC: Department of Dental Ecology, University of North Carolina; 1997. p. 25-46. Cheng CK, Channarith H, Cowling BJ. Potential use of school absenteeism record for disease surveillance in developing countries, case study in rural Cambodia. PLoS One 2013;8:e76859. Kille DR, Wood JV. Self-Esteem. In: Ramachandran VS, editor. Encyclopedia of Human Behaviour. 2nd ed. California: Elsevier, Academic Press; 2012. p. 321-27. Singh A, Purohit B. Targeting poor health: Improving oral health for the poor and the underserved. Int Aff Glob Strategy 2012;3:1-6. World Health Organisation. Global Oral Health Data Bank. Geneva: World Health Organisation; 2000. Piovesan C, Pádua MC, Ardenghi TM, Mendes FM, Bonini GC. Can type of school be used as an alternative indicator of socioeconomic status in dental caries studies? A cross-sectional study. BMC Med Res Methodol 2011;11:37. Cottle TJ. Self-concept, ego ideal and the response to action. Sociol Soc Res 1965;50:78-88. Blascovich J, Tomaka J. Measures of self-esteem. In: Robinson JP, Shaver PR, Wrightsman LS, editors. Measures of Personality and Social Psychological Attitudes. New York: Academic Press; 1991. p. 115-60. Macgregor ID, Balding JW. 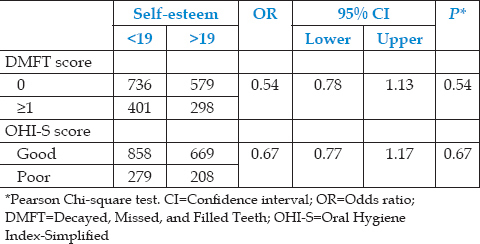 Self-esteem as a predictor of toothbrushing behaviour in young adolescents. J Clin Periodontol 1991;18:312-6. Källestål C, Dahlgren L, Stenlund H. Oral health behavior and self-esteem in Swedish adolescents over four years. J Adolesc Health 2006;38:583-90. Baumeister RF, Campbell JD, Krueger JI, Vohs KD. Does high self-esteem cause better performance, interpersonal success, happiness, or healthier lifestyles? Psychol Sci Public Interest 2003;4:1-44. Muirhead V, Marcenes W. An ecological study of caries experience, school performance and material deprivation in 5-year-old state primary school children. Community Dent Oral Epidemiol 2004;32:265-70. Seirawan H, Faust S, Mulligan R. The impact of oral health on the academic performance of disadvantaged children. Am J Public Health 2012;102:1729-34. Centers for Disease Control and Prevention. National Survey of Children's Health. Available from: ftp://www.ftp.cdc.gov/pub/Health_Statistics/NCHS/slaits/nsch07/1a_Survey_Instrument_English/NSCH_Questionnaire_052109.pdf. [Last accessed on 2014 Sep 20]. Crowley E, O'Brien G, Marcenes W. School league tables: A new population based predictor of dental restorative treatment need. Community Dent Health 2003;20:78-82. Blumenshine SL, Vann WF Jr., Gizlice Z, Lee JY. Children's school performance: Impact of general and oral health. J Public Health Dent 2008;68:82-7. Garg N, Anandakrishna L, Chandra P. Is there an association between oral health status and school performance? A Preliminary study. Int J Clin Pediatr Dent 2012;5:132-5. Piovesan C, Antunes JL, Mendes FM, Guedes RS, Ardenghi TM. Influence of children's oral health-related quality of life on school performance and school absenteeism. J Public Health Dent 2012;72:156-63. US General Accounting Offices. Oral Health: Dental Disease is a Chronic Problem among Low-Income Populations. Washington, DC: Report to Congressional Requesters; 2000. Available from: http://www.gao.gov/new.items/he00072.pdf. [Last accessed on 2014 Dec 20]. Koretz DM. Limitations in the use of achievement tests as measures of educator's productivity. J Hum Resour 2002;37:752-77.